Holistic Therapies have been around for thousands of years and were commonly used in ancient Egypt, China and India for their therapeutic effects. Hippocrates, an ancient Greek physician, held the belief that the body must be treated as a whole and not as a series of parts; he believed in the natural healing process of rest, a good diet, fresh air and cleanliness. In the fourth century BC, Socrates warned that treating only one part of the body would not have good results. Interestingly, it was only at the beginning of the twentieth century that the principles of holistic medicine fell out of favour in Western societies. Today many people are now realising the power of holistic therapies to bring emotional and physical balance back into their lives. At Barefoot Therapies we follow some of these ancient principles and aim to treat mind, body and soul helping clients to restore their equilibrium and natural healing properties. Please have a look at Barefoot Therapies Holistic packages below for the details of the therapies we offer. The practice of using essential oils for mental and physical well-being dates back to Egyptian times. It was well known in ancient times - for healing mind and body. The essential oils are extracted from plants and trees and are highly effective remedies with their own therapeutic properties. Essential oils can be diffused or inhaled, or used for therapeutic massage. An holistic practitioner treats the whole person and takes account of their emotional, spiritual and physical wellbeing. Massage is a safe, soothing and non-invasive therapy, it increases the release of serotonin, the body’s ‘feel-good hormone’, and encourages the body to produce natural pain-killing endorphins. It also reduces the amount of cortisol, the ‘stress hormone’, in the body. Holistic massage is specifically tailored to each client. Reflexology is the ancient method of promoting good health by working pressure points on the feet and hands that correspond to different organs, glands or structures of the body. Reflexologists believe that when the body is ill, injured or stressed, vital energy pathways are blocked preventing it from functioning optimally. Reflexology is thought to help unblock these pathways by ridding the body of toxins and improving circulation. Reflexology uses a natural therapy and practitioner expertise to support fertility issues. Maternity reflexology aims to optimise the health potential of the pre-pregnant couple. The first consultation will include the taking of a full medical history and detailed notes on your diet and lifestyle before deciding on a course of treatment. There may also be some diagnostic reflexology. At Barefoot Therapies we prefer to see both partners if possible; however, this is not essential. The initial consultation costs £90 for a single client and £120 for a couple. Reflexology uses a natural therapy and practitioner expertise to support fertility issues, pregnancy & birthing. Maternity reflexology aims to optimise the health potential of the pre-pregnant couple and the pregnant woman. Alongside the reflexology treatment, you will receive advice on nutrition, lifestyle and how to optimise health before, during and after pregnancy. This is a lovely relaxing treatment that gives a sense of calm and wellbeing. Indian head massage releases stress that accumulates in the tissues, muscles and joints of the head, face, neck and shoulders. It is particularly effective for fatigue, insomnia, migraine and sinusitis, and for relieving stress and tension. Ear candling has been used for thousands of years by many ancient civilisations. The American Indian tribe called the Hopis are believed to be the original source of this technique. Candles are still made today on the basis of the traditional formula using cotton tubes, impregnated with beeswax, honey and therapeutic oils. Research has identified positive benefits for those suffering from conditions such as compacted earwax, earache, cold, headache and tinnitus. Take a look at the principles of healthy eating and discover how to improve your well being through the food you eat. Not sure which treatment is right for you? 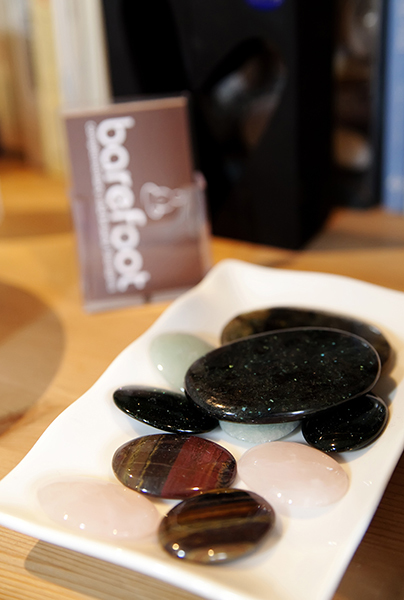 at Barefoot Therapies treatments can be tailored to suit your requirement. Please Contact Me for more details.